This dish was my New Year's day dinner. Where I grew up in Kentucky, you ate black eyed peas and collard greens for luck in the New Year. I'm a little late in posting this, but black eyed peas are delicious and healthy. You can eat them anytime! I have packaged up and frozen several servings for reheating for workplace lunches. 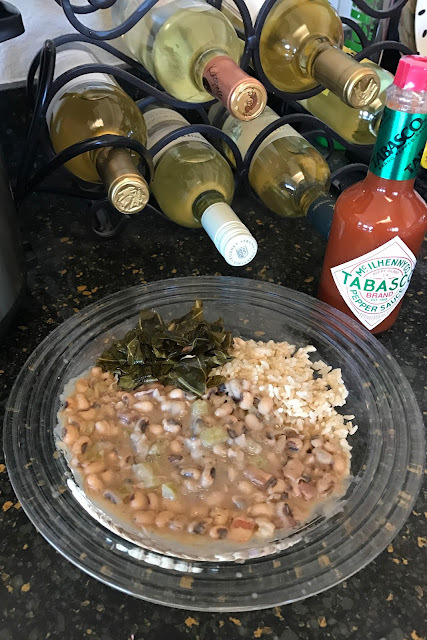 My version is based on a recipe from a Tabasco sauce brochure I've had since I lived in Mobile, Alabama in the 1980's. 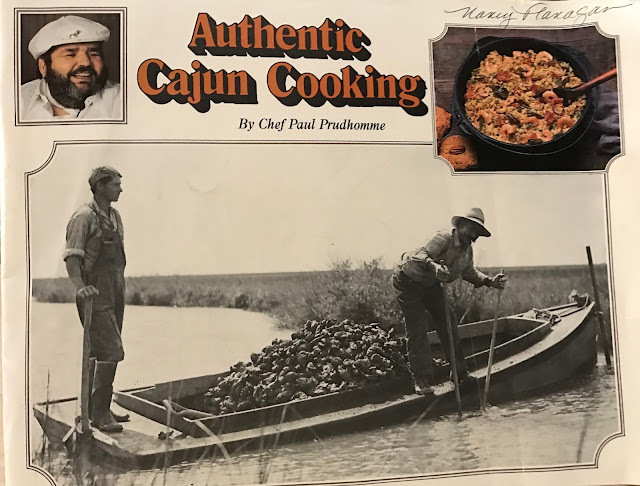 All of the recipes in the brochure were written by the late New Orleans chef Paul Prudhomme. 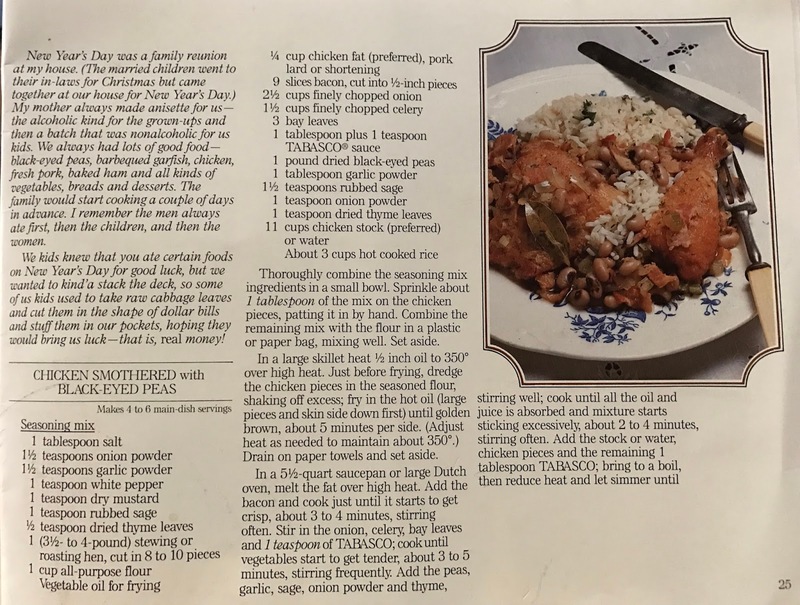 Although it was available for a minimal price, it's a great little cookbook with stories and pictures of Cajun life "back in the day." Now that I have the Instant Pot, I've been making a lot more dishes with dried legumes. Before, preparing them was an all day challenge. since Albuquerque is a mile high city, it took forever to cook beans soft enough to eat. It was easier after I acquired a stovetop pressure cooker, but using it still required a lot of watching, and the thing was a pain to clean. With the Instant Pot, it's faster and easier, so I've been adapting some of my old recipes. The original recipe includes chicken fried and smothered with black eyed peas and served with rice. It's good, but rich! So I decided to focus on the black eyed peas instead of making the entire recipe, which is quite a production between frying up a chicken and simmering peas on the stove. Using saute function (medium), heat oil in the Instant Pot. Add the bacon and cook until it starts to become crisp, about 3-4 minutes, stirring often. Stir in the onion, celery, bay leaves, and 1 teaspoon of Tabasco; cook until vegetables start to get tender, about 3-5 minutes, stirring frequently. Add the peas, garlic powder, sage, onion powder, thyme, pepper, and mustard; stir well. Cook until all the oil and juice is absorbed and the mixture starts sticking, about 2-4 minutes. Add the stock and remaining 1 tablespoon of Tabasco. If needed, add additional water if needed to cover mixture about an inch. Reset the Instant Pot to Manual and 7 minutes, then lock down the lid to pressure cook the peas. Once the cycle is complete, natural pressure release for 15 minutes and open. If the mixture is too watery, set the Instant Pot to saute and boil off the excess liquid until the the peas and sauce are the desired thickness. I'd describe the texture as saucy but not soupy. I hope that makes sense. Serve the peas over hot cooked rice. The original recipe used white rice, but I used brown rice that I had previously made in the Instant Pot using the instructions in the manual. Yes, it does sound like a lot of spice, but it's flavorful, not spicy-hot. This could easily be made vegetarian by omitting the bacon. You do need the oil in order to saute the onion and celery, so don't skip that. I found the pressure cooking timetables in Hip Pressure Cooking by Laura D. A. Pazzaglia to be helpful for determining the cooking time for the black eyed peas. She also has a good section about soaking beans. So far, I haven't followed any of her recipes exactly but have used them as guidelines to adapt my own recipes. I also served the peas and rice with some collard greens. This was not a recipe per se, although I figured out how to make it in the Instant Pot by adapting the recipe "Collard or Dandelion Greens with Slab Bacon, Pecans, and Malt Vinegar" from Pressure Cooker Gourmet by Victoria Wise. Using saute function (medium), heat oil in the Instant Pot and saute the garlic. Making sure the collard greens are dry, add them to the Instant Pot and stir. They will wilt down. Combine vinegar and water and add to the greens. Reset the Instant Pot to manual and 5-7 minutes, then lock down the lid to pressure cook the greens. Once the cycle is complete, natural pressure release for 5 minutes and serve. We found the solution to cooking beans at 7000 feet in America's Test Kitchen: brine them overnight. It works! What a nice recipe! Thanks for posting it. To Wendy, brine the peas how, in the spices listed by Nancy above? Interesting about the brining. How does that work? Thanks Lyrique Threads and Wendy. I appreciate your comments.